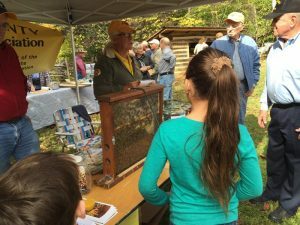 The Surry Beekeepers will have a table at the Cornshucking Frolic again this year. This is a great event and a great chance to educate the public about honey bees and beekeeping. Come join us! Get on board and join us for the 26th Annual Cornshucking Frolic at Horne Creek Farm on Saturday, October 21 from 10 am – 5pm. Admission fees are as follows: Adults: $8.00, Children 6 – 12: $5.00, & Children 5 & Under: Free. [Payment by cash or check only]. Heritage activities are sure to please the whole family. Surry Beekeepers, quilting, basket weaving, log hewing, blacksmithing, wagon rides, a grist mill demonstration, cooking on a woodstove, plowing, chair caning, cider, apple butter & molasses demonstrations, display of quilts, antique farm equipment, seven bands playing Traditional ,Bluegrass, & Gospel music, plus much more!. Food available throughout the day for a nominal fee: Chicken Stew, BBQ, Ham Biscuits, Pintos & Cornbread, Fried Pies, Sonkers, Ice Cream, and Beverages. Finish off by shopping at the HCF country store and with our vendors. No pets (other than service animals) allowed. No alcoholic beverages allowed. Canceled in the event of heavy rain. The testing sites, dates, and times for the FALL REGIONAL TESTING for the Master Beekeeper Program have been established. If you are studying for an exam coming up in October, be sure to check out the Games and Quizzes on the NCSBA website. They are new as of the first of September. A good suggestion would be to go through all six as a refresher. The web site, wilkes.ces.ncsu.edu has along side the title, “Wilkes County Center” a google icon for direction assistance. We have been advised that the location is GPS challenged so to help you locate the facility – note that it is located off SR 421 at exit 285, north 500 feet to Executive Drive on the left. There will be practical exams for Journeyman and Master Levels only. Certified Practical Exams will not be issued at this time/location. With uncertain track of hurricane Irma, there are some important considerations for beekeepers who may be affected by the heavy rain and winds. Please further disseminate to your local network of beekeepers.